A historical novel that dramatizes the survival of the Order of the Knights Templar. Lindley’s ambitious two-part debut concerns the titular knights, a group that was founded in the 12th century. It fought its way to legendary status during the Crusades, but was disbanded in disgrace in 1312 by papal decree. Lindley builds his novel on the events following the order’s destruction by King Philip of France, who issued arrest orders for the Templar leadership, including Grandmaster Jacques de Molay. These leaders are tortured by members of the Dominican Order into confessing the order’s alleged sacrilegious secrets; in the aftermath, knights flee to far outposts of Europe and plot their vengeance on the order that brought them down. The author grounds the sections set in the 14th century by occasionally shifting their focus to the year 2010 to detail the story of Jesuit brother Aloysius Daly, whose research into the Order reveals the destruction of Dominican churches and monasteries. Lindley follows the fleeing Templars first to Scotland for the Battle of Bannockburn in 1314, and then, in the second volume, to the Battle of Morgarten in Switzerland the next year. The author packs both parts of his book with a large cast of vividly drawn characters, and his action scenes are consistently engaging. A good deal of the novel’s rhetoric has a melodramatic tone that calls to mind his fellow Templary novelizer, Sir Walter Scott. For instance, take this passage from the torture of de Molay: “Pinioned in chains he too, like his brethren, discovered that unlike blows and wounds taken in the rush of battle, his naked flesh could not indefinitely hold out and withstand the intolerable pain, unremittingly and mercilessly applied.” However, readers should note that the book is also oddly formatted, with no indents to be found. 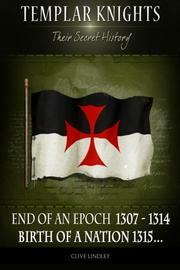 A colorful tale of the long revenge of the Templars that often makes for compelling reading.